Gold processing often takes place on site, using mercury or other harsh chemicals to extract the metals. Precious metal mining creates the largest global demand for mercury, and is the single largest source of intentionally released mercury in the world. The irresponsible use of mercury and its waste causes irreversible damage to the local environment, and subsequently the health of the surrounding communities. One special feature of La Llanada mining is its use of gold extraction via gravity methods, without the use of mercury or any toxic chemicals. In addition, our small-scale miners use agave and rain water (no bleach or Clorox) during the concentration process, avoiding the use of toxic chemicals. 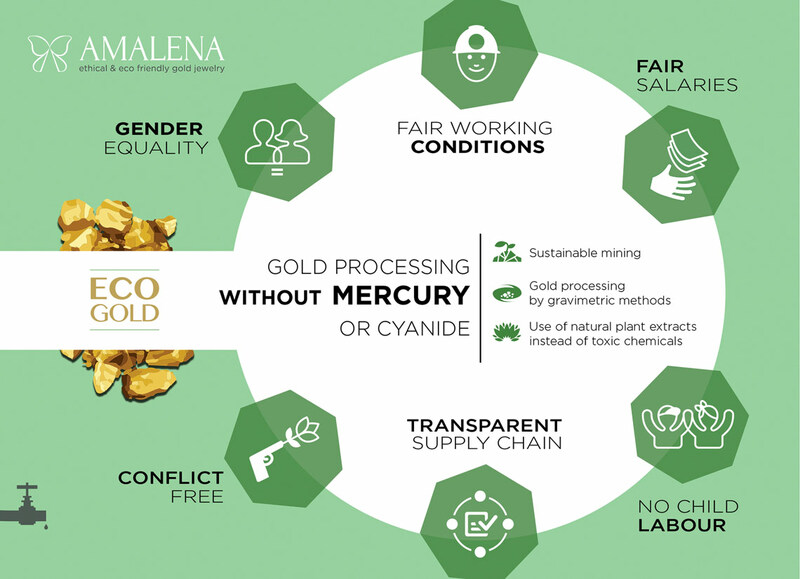 This “Eco-Gold” comprises all of Amalena’s jewelry, and we are honored to offer our clients this unique metal mined by hand and processed with 100% eco-friendly techniques. This is only the beginning. Mining is a delicate process, and improvements stand to be made. We are thrilled to continue our partnership with miners and organizations in La Llanada to refine their technologies and support their economies – bringing you the cleanest, purest gold jewelry available.